Lee Mowle and Phil Keen have teamed up in 2017 to take on the challenge of the Michelin Le Mans Cup with their focus firmly set on the title and the 24 Hours of Le Mans invitation in 2018. Phil Keen from Reading in the UK is well known as one of the fastest GT drivers in Europe. The 33-year-old is a former British GT Champion and a race winner at every level including the European Le Mans Series and in the FIA Masters Historic Sports Car Championship. Race driver and team owner Lee Mowle from Wimbledon in Southwest London is teamed up with Phil Keen for the first season together and the bronze rated driver has three wins to his credit, including a class win at the Dubai 24 Hours. The 52-year-old is currently competing in both the Michelin Le Mans Cup and the British GT Championship with the team’s very distinctive AmDtuning backed Mercedes AMG GT3. 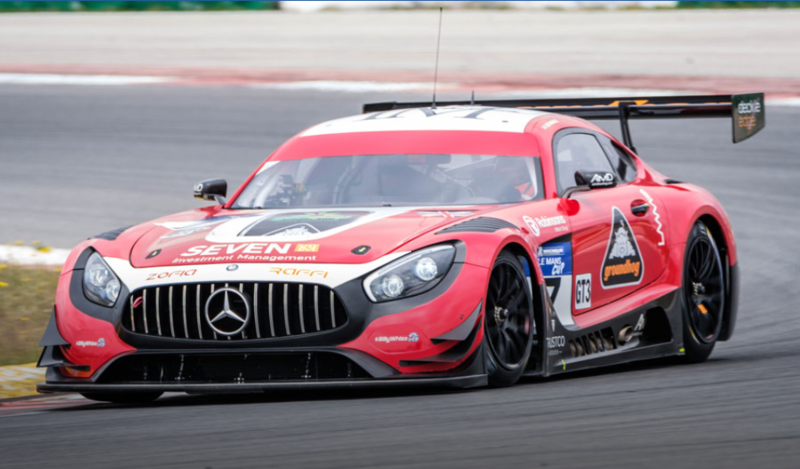 The British duo got their campaign off to a great start in Italy when the no7 Lee Mowle Mercedes took the chequered flag after an action packed 120-minute sprint race. Phil Keen had been trailing the no75 Optimum Motorsport Audi of Joe Osborne but the lead car had to serve a late drive through penalty for a pitstop infringement, which allowed Keen to take the lead and the win. The British team were leading the series going into the showcase Road to Le Mans event with La Sarthe debutant Lee Mowle extolling the virtues of a racing on the full 13.6km La Sarthe track for the LMC TV coverage. The weekend started well, with the no7 Mercedes finishing second in the GT3 category, but the jubilation was short lived after the team were handed a time penalty for a pitstop infringement which dropped them back to 13th place finish in race 1. This was followed up by a fighting 6th place finish in race 2 on Saturday morning, which wasn’t the result the team had been hoping for at the start of the week at Le Mans. There was a silver lining to this particular grey cloud in the fact their championship rivals also didn’t score well either. This means the Lee Mowle crew head to Austria with 29.5 points, just 1.5 points behind the double race winning TF Sport Aston Martin of Ahmad Al Harthy and Tom Jackson but this car was only entered for the Road to Le Mans event, so Lee Mowle Motorsport head to the Red Bull Ring as effective championship leaders. The Red Bull Ring provided the setting for Round 3 of the 2017 Michelin Le Mans Cup with a 2-hour race on the 4.3km track in the foothills of the Styrian Alps on Saturday 22 July.